Knitting starts out so simple-just a pair of knitting needles and a ball of yarn, then it grows to dozens of needles, miles of yarn, and piles of projects. For those of us who never have enough storage there is the Stitch Happy Tote Organizer. This well-organized tote gives you space for projects, yarn bowls, knitting looms, circular needles, and of course yarn. Keep everything you need in one bag and look great at the same time. The large 13 x 10.5 inch bin is big enough to hold 9+ skeins of yarn (even big & chunky yarn), while the 4-way divider allows you to organize and separate everything to taste. Your Stitch Happy Bin only uses Halo-Zip Technology on all closures. Halo-Zip uses soft halo ringlets to fasten and zip, instead of the old angular teeth that snag and tangle. With 7 double-stitched pockets, plus the Halo-Zip tool pouch & outside pocket, you can neatly store knitting needles, crochet hooks, tools, yarn, and patterns, all while keeping everything easily accessible. With the Stitch Happy bin you have plenty of storage for most projects, including yarn bowls, large hooks, needles and even your directions. When you're at home, store the bin on a shelf, or in your knitting storage area. 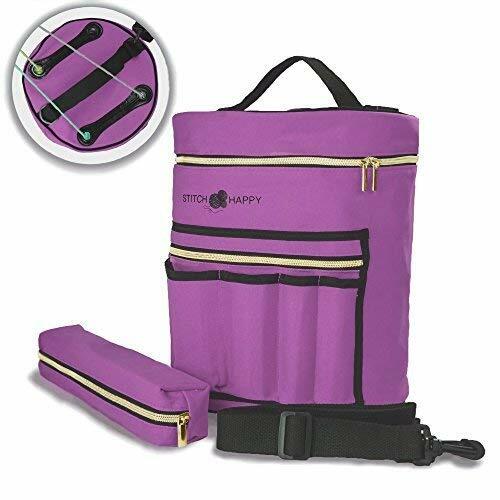 When you are on the move, simply snap the 2 Position shoulder strap into one of two comfortable positions and take your knitting projects on the go. Increase your joy and your productivity by organizing your knitting projects with your own Stitch Happy Tote. - Halo Zip & Carefree: The silver zippers on silver gray fabric are more than a trendy design - the Halo Zip technology zips shut with smooth ringlets, so no snags or unraveling, while the durable fabric design folds flat & shrugs off stains for long-lasting, peace-of-mind storage. - Beautiful Protection: This large bin has a zip-up top & pocket to guard from spills, snags, tiny hands & furry paws; Plus the 4-way divider keeps yarn flowing tangle-free even to the end, so you can relax knowing nothing will unravel your hard work. - Designer Yarn Storage: This 13 x 10.5 inch stylish bag is everything you've always wanted! With storage for 9 skeins (even big & chunky), PLUS lid-slits for easy yarn access - it's the right yarn tote for clutter-free knitting. - 7 Pockets + Tool Case: De-stress your knitting storage with a tool case & double-stitched pockets for every needle, hook, scissor or notion - no more searching through piles of yarn & stacks of projects, just re-energize and refresh. - Stow-Or-Go Design: Stitch Happy Yarn Organizer Totes are big enough for home storage, yet the lightweight design and 2-position Easy-Carry strap lets you quickly pack-up to trade stitches with friends over coffee.